Click here to see the barn when it was full. Click here and here to see other Same Scene, New View photos. I'm a transfer from Illinois to Colorado. I love seeing pictures from 'back home in the Midwest,' on your blog. I see by this picture that the trees have that soft gray look that they get just prior to showing leave buds. Is the Ilama pregnant yet? I finally got around to making those cheese and scallion scones. They were excellent. I had one toasted for breakfast this morning and I think it was even better that way. I'd love to hear about your variations on the scone recipe. The chive version sounds yummy and I bet you have others so keep those coming. 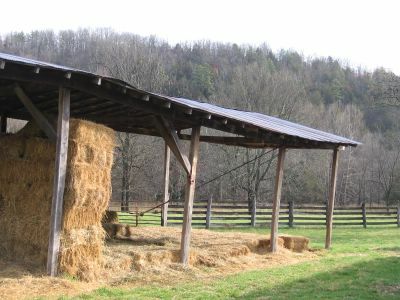 Wow, be grateful you have hay still... I know a few farmers here who would love to still have some bales in thier barns. They are shipping it in still from other places. When are you going to post your recipe for OatmealToasting Bread? I am soo looking forward to trying it. Even though I never got "puffy" pitas. (They made excellent pizzas, and i get requests for more all the time). Hope your weekend is quiet and pleasant!